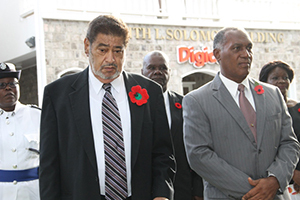 NIA CHARLESTOWN NEVIS (November 10, 2014) –Nevis joined the rest of the Commonwealth for the observance of Remembrance Day, with a service which was held at the War Memorial in Charlestown on November 09, 2014, in memory of the soldiers of St. Kitts, Nevis and Anguilla. Premier of Nevis Hon. 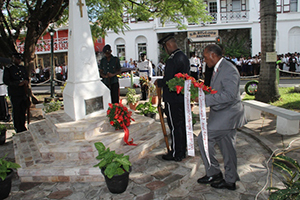 Vance Amory and Deputy Governor General His Honour Eustace John were among those who laid wreaths during the service which was officiated by Canon Ernest Flemming. During the service there was also a gun salute and prayers were offered. Among those in attendance at the service were Ex-Servicemen, a contingent from the Royal St. Christopher and Nevis Police Force, the Nevis Cadet Corps, Uniformed Bodies and students of the Nevis Sixth Form College, secondary and primary schools. 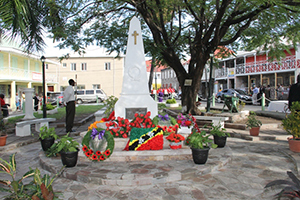 Remembrance Day is recognised annually on November 11 but the parade and ceremonial events are carried out on Remembrance Day Sunday in St. Kitts and Nevis. The Day is celebrated in recognition of the soldiers who died fighting in the First and Second World Wars. The red remembrance poppy which has become a familiar emblem of Remembrance Day, was worn by those in attendance. The poppy flower was made popular by a poem “In Flanders Fields”. It is said to have bloomed across some of the worst battlefields of Flanders in World War I and their brilliant colour became a symbol for the blood spilled in the war.